This event is open and decentralized, meaning that while we are all coordinating with one another under one event, each hosted event is its own fully autonomous project, and open to anyone inspired enough to host an event and coordinate with their local community. We hope that each host and event feels inspired to add whatever personal creativity, inspiration, touches, or action to their offering as well as graciously coordinate with local events. The last thing we want is for any offerings from this event to be in conflict with any local community events. Be a good community member and lets all coordinate, be gracious, and work together! Lots of exciting and creative things are already being offered. Some hosts are organizing raffles, pay-by-the-plate dinner parties, a fundraiser bar at a local dance party, interactive games between parties, and more are just a few of the great ideas already happening. Let us know how we (Recess's Organizing Team) can be of service to help your event and offering be as big as a success as possible and we will do everything we can. Email Justin at Bluesrecess@gmail.com for any help or post on the event Facebook page. We will have live DJ streaming starting at 10pm London Standard Time, 2pm American Pacific Standard Time, and it will run until either 3am American Pacific Standard Time, or 2am Melbourne, Australia, time, depending on if Melbourne ends up hosting an event or not. We will have the DJ lineup posted here as it is finalized. Very soon we will have our online fundraising campaign go live. Certain donation tiers will be labled "entrance to local events". Party goers can then print out their donation contribution and give it to the local hosts as their party entrance so that you can tally how much your local community helped raise on its own. The online fundraising campaign will stay live for one week after the night of the Global House Party, giving each local host time to tally their expenses and on-site cash donations and still make a collective donation online before the campaign is over. The local party that raises the most money will get to pick a local, in-need, community member of their choice to be flown, expenses paid, to a Recess event of their choosing. We will be using Dubtrack.fm as the service for our live streaming. We have started a "Global House Party Test Room" for you to log on and see how it works. Any party that wants to be tuned into our station and with reliable Wifi (or much preferably, a wired ethernet connection) can do so by directly streaming from this above page at any time. They can also feel free to tune in or tune out as they please. Our hope is that the events, while separate and unique, feel unified. Feel free to coordinate between other parties, draw fun games and interactions between the event as a whole, and help us draw a fun and interactive web of community across the globe through this one event! 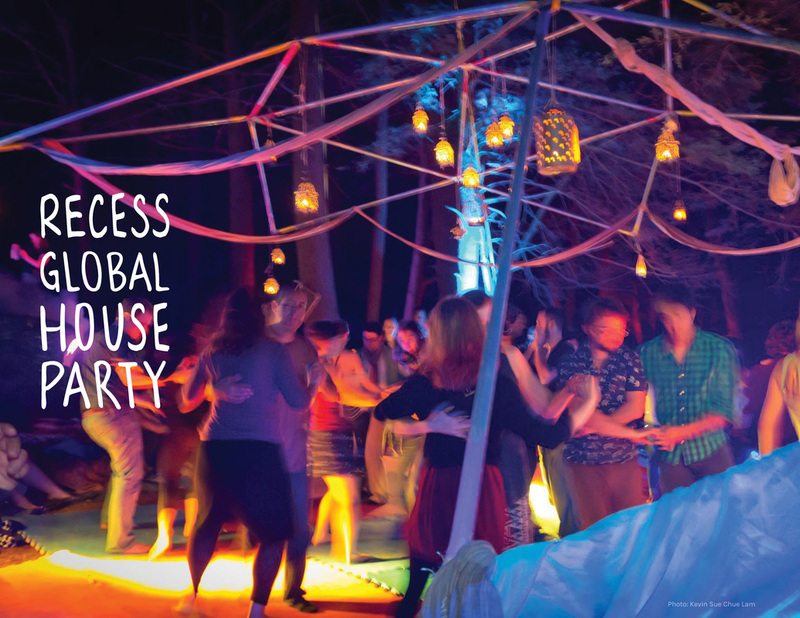 ​If you are a DJ for the global house party, you will have a specific time slot when you will be slotted to DJ. You will cue up songs from either Youtube or Soundcloud through "Recess Global House Party Room" . If you are DJing and have a Soundcloud account, feel free to audio record your own tracks if you want. With these you can introduce your set and local party, give a shout out to other house parties, and help personalize your set with personal audio tracks uploaded from your own Soundcloud. Come the day of the event we will have a FB group chat between all of the DJs and hosts so that we can all stay up to date on current happenings, stay seamlessly coordinated between DJs, and are able to troubleshoot anything that may come up.